Wenn ihr eine kurze Pause vom actionreichen Spiel MAH braucht, könnt ihr auch das Spiel „Quod Init Exit“ durch Drücken der Taste Q im Hauptmenü starten. Eigentlich als Goodie für RGCDs Modulversion gedacht, da das Spiel Quod Init Exit nicht mehr als Modul erhältlich ist, hat es dieses Easteregg aber auch in unsere Diskversion geschafft. If you ne ed a little break from the action-packed game MAH, you can also start a game of „Quod Init Exit“ by pressing Q in the main menu. This was meant as a goodie for RGCDs cartridge version since the original cartridge of Quod Init Exit is not available any longer, but this easter egg also made it into our disk version. NEUES AUS DER C64 SZENE: Tolles MAH Playthrough – wie Jeff Minter? „Das Spiel sieht fast aus wie ein sensorisch überladener Jeff Minter“ – jaaa, das ist MAH! RetroGamerNation hat ein fantastisches Playthrough-Video von unserem actionlastigen psychedelischen Spiel ‚MAH‘ erstellt. NEWS FROM THE C64 SCENE: Great MAH Playthrough – like Jeff Minter? „The game looks almost like a Jeff Minter sensory overload“ – woohoo, that’s MAH! Wenn Dir ausgefallene Spiele gefallen, könnte Dich MAH von Retream interessieren. MAH ist das erste Spiel, das von RGCD und Protovision gemeinsam veröffentlicht wird und wird ab dem 2. März in beiden Shops verfügbar sein. Die Protovision-Version von MAH (Disketten-Version) kommt mit sieben Referenzkarten an Stelle von einer Anleitung daher und ist das dritte Spiel in unserem neuen Kartonbox-Gewand. If you like games that step out of the norm, you might like MAH by Retream. MAH is the first game to be published in cooperation by RGCD and Protovision and will be available 2nd of march in both shops. The Protovision version of MAH (disk version) comes with quick reference cards instead of a manual and is the 3rd game to feature our new cardboard box. Announcement: MAH boxed release coming! 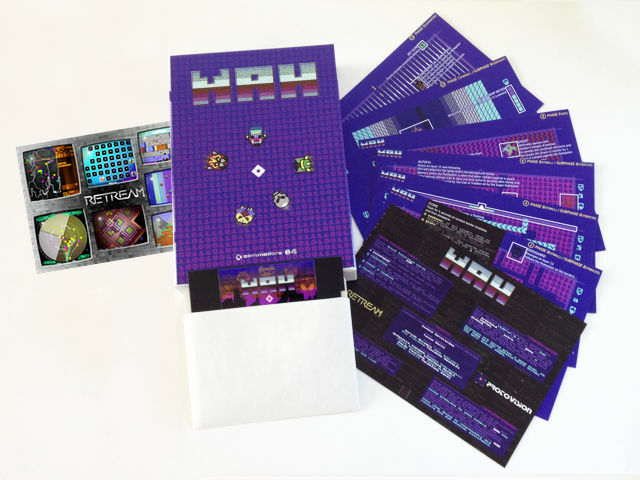 Retream’s highly original and complex C64 action game MAH is now getting a proper physical release. The game has been massively overhauled, enhanced and extended in comparison to the initial version. RGCD and Protovision have teamed up with Retream to bring MAH to market. RGCD will handle the cartridge release, while Protovision will release MAH on disk in a Protovision cardboard box. Ankündigung: MAH in der Box kommt! Retreams originelles und komplexes C64-Actionspiel MAH bekommt nun eine anständige Box. Das Spiel wurde im Vergleich zur initialen Version von Grund auf überarbeitet, erweitert und verbessert. RGCD und Protovision arbeiten Hand in Hand an der Veröffentlichung von MAH. RGCD kümmert sich um die Modulversion, während Protovision die Diskettenversion in einer Protovision-Pappbox anbieten wird.